We take for granted that students have safety, food, housing and clothing — but many students do not. If our goal at Cal Poly is to get students to graduate, then they have to be equipped with the tools they need to get there — and one of those is adequate food. 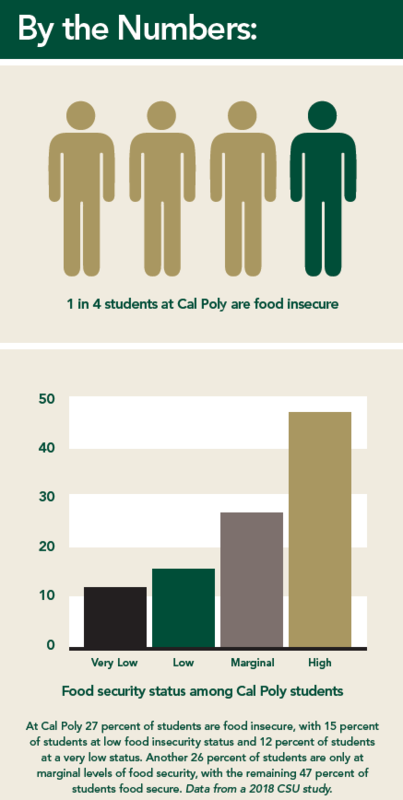 Every day as many as 6,000 Cal Poly students experience food insecurity — not knowing where their next healthy meal will come from. A student outreach group, overseen by Professor Aydin Nazmi of the Food Science and Nutrition Department, have stepped up to make sure that struggling students are connected with resources to reduce hunger on campus. 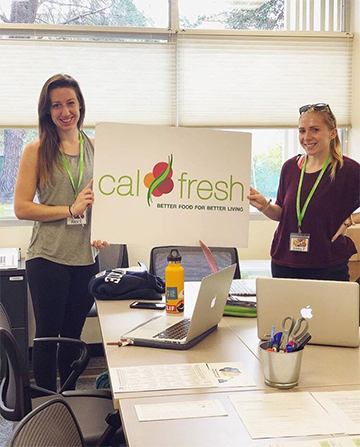 Condron helped launch the CalFresh outreach effort at Cal Poly, a nutrition assistance program funded by the U.S. Department of Agriculture and administered by the state Department of Social Services. The federal program provides funding to low-income individuals or households for nutritious foods at participating stores and farmers markets. On average, Cal Poly students who qualify receive $150 a month to spend on groceries. Cal Poly is one of 11 CSU campuses participating in the outreach efforts — led by California State University, Chico’s Center for Healthy Communities. A two-year grant has paid for campus outreach efforts. The team is seeking a renewal of the grant for an additional three-year period. 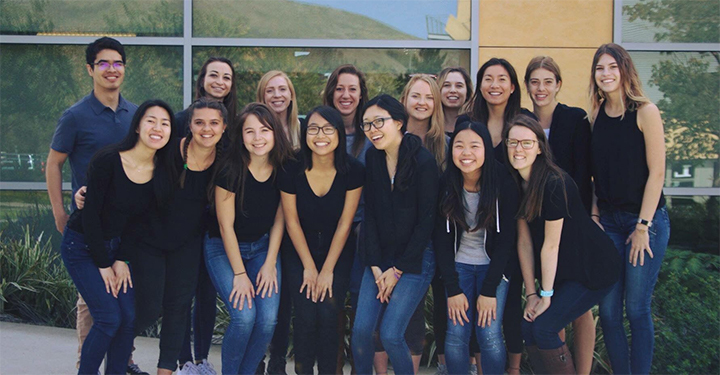 Today, 15 student interns and a five-member student leadership team from across Cal Poly assist outreach efforts by canvassing the campus with information about the program and holding drop-in hours and private appointments at various locations to assist students in applying for the program. Third-year nutrition major Angela Yue has been working with CalFresh outreach since fall 2016. “I was looking to be more involved on campus and the topic of food insecurity is important to me,” Yue said. In the last two years, the group has helped 300 students apply for the CalFresh benefits but only about half of those qualified. A stringent set of requirements must be met in order for a student applicant to qualify for assistance. Yue said that she was surprised at the number of people that need help but are not eligible. “Students have come in before that are homeless and are in obvious need of the CalFresh benefits, but they just didn’t meet the guidelines.” Third-year nutrition major Claudia Lavina, who also helps with outreach efforts, said that each time a student is approved is a moment of triumph. To qualify, students meet one of several criteria including: work a minimum of 20 hours a week; be approved for a state or federal work study; have parental control over a dependent; be a recipient of CalWORKs or be enrolled in Extended Opportunity Programs. “There is a definite gap between eligibility criteria and need that keeps students from receiving the benefits when they could really use them,” said Nazmi. While it is always difficult to turn students away, Cal Poly has launched a number of other options on campus to help students struggling with food insecurity including the Cal Poly Food Pantry, a monthly food distribution through the Food Bank Coalition of San Luis Obispo County and the new Mustang Meal Share that allows students to donate unused meals from their campus meal plans.